I’ve taken the liberty to send you a couple pictures of my latest accomplishments. The Christmas tree is the 5th item I’ve made, it stands about 7″ tall. I twisted wire to make the star, and I added star shaped beads for ornaments. The lamp is the 6th item I’ve made. Each panel of the lamp shade is 14″ across the bottom, and is on a 14″ tall base. I soldered ball chain to the bottom edge for decoration. And, I designed both of them. Admittedly I took ideas from things I’ve seen on the internet, but I did draw and make my own patterns. Feel free to offer any constructive criticism; I want to know about any mistakes I make. 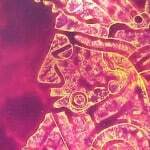 As always, I am inspired by your work, and I gain so much from the “how to” instructions that you offer. Hope things are great across the pond. Thanks for your wonderful website! Thank you Gail for taking the time to send your lovely work. Well done for designing them yourself, and so early on in your stained glass journey, wow! You could think about the glass you use for the tree for the next one you do. Perhaps not so dark and more textured so that it adds interest when you look through it? 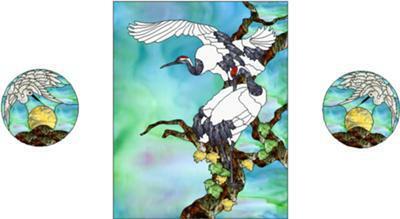 These designs are drawn with Glass Eye Professions software. Glass examples shown the various lites can be changed at will any number of times in the design image, lines altered, etc. 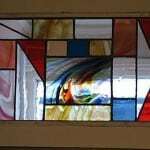 Wow, I’ve often wondered about stained glass software – whether it would be worth exploring to help with designing – and I think this answers my question. Have you tried any others, or just this one Larry? Is it easy to get a grip on it, or does it take so long that it makes it less than worthwhile time-wise? 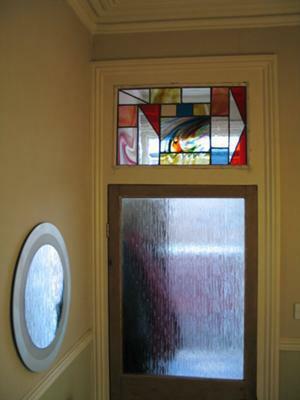 This transom window is by Lee, one of my students, and was a little bit tricky to make due to the antique glass that she used. Those are the streaky bits in the middle and a couple on the edges. When I say ‘antique glass’, I mean handmade rather than hundreds of years old, and because of this it is irregular in thickness, sometimes up to 4mm and down to 2mm. Lee’s use of colour is interesting and cleverly done, with warm colours balanced perfectly with the cooler blues. We had a half circle window in our home that I did not want to cover with the traditional fan window covering but it let in too much light for my husband’s tv. I had taken some classes from a local glass store and I had created several small projects, but nothing of this size. It is copper foil, reinforced with braided zinc. 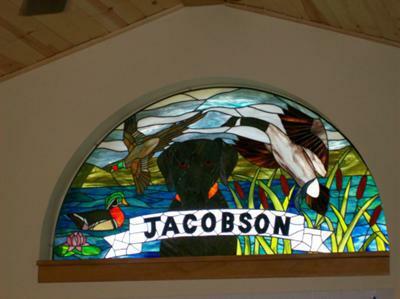 There are several varieties of art glass and some painting involved to opaque the dog (Wallace) in the center. I hope you enjoy. I love it! I take it your dog likes chasing birds?! 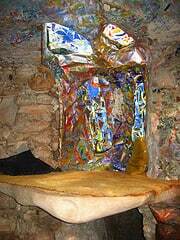 This is a very complex piece of glass art work beautifully executed and thoughtfully made. 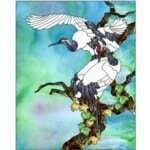 I especially like the way you’ve chosen the glass to mirror the subject – the flying birds for example. It shows a sense of humour and would be very welcoming for visitors I think. Well done for having a go at such a large piece – I hope your husband likes it! These images are by Lindsay, one of my students who wanted to have a glass wall feature, but didn’t want a big light box construction behind it. Using the mirror is a really good idea, as it reflects the glass colours and adds space to the room. 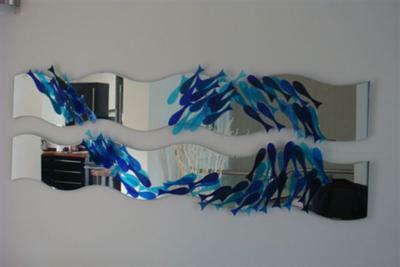 The design is great, it really gives a sense of the movement of a shoal of fish in the sea. 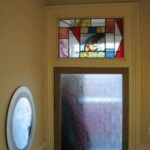 This was also helped by the antique (handmade) glass that Lindsay used. Glue was used to stick the fish on, but if you’re going to have a go at this, make sure that all the edges are ground and safe beforehand. I found this on the web and wanted to share it with you. It really is the most amazing place, where the glass wall art IS the wall! The love and care that’s gone into designing these abstract patterns, and putting it all together to create a whole environment of arts and crafts loveliness – is amazing. The images are a little small to see exactly how they’ve been made, but it looks like applique, using coloured glass sheets. I can’t see clearly enough to see if there’s any lead came in there or not. I wonder what it’s like to live somewhere like that?…I’m imagining waking up to a stained glass ceiling… Has anybody been who can tell us more? Apparently you can arrange for visits.